Surface Design Awards 2019 finalists have been announced and KSR Architects is in the running! We are thrilled to be a finalist in the Retail Exterior category for our lululemon windows project. 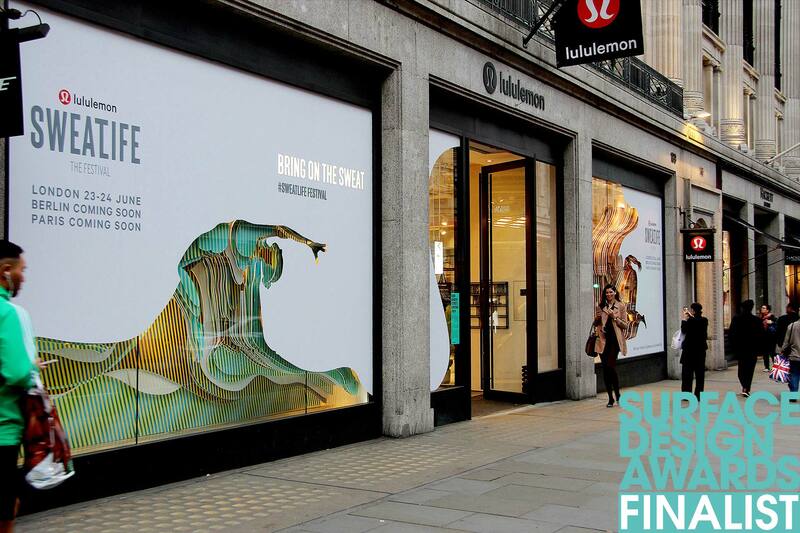 KSR Architects was paired with luxury urban fitness and yoga apparel brand lululemon to design their shopfront as part of the 2018 RIBA Regents Street Window competition. Two large window displays reflected the energy and lifestyle associated with the brand and promoted their Sweatlife Festival. 197 projects from 22 different countries were entered into this year’s Awards and the judging panel hand selected 48 finalists across the 13 categories. Each entry was judged on the particular use of materials, the type and finish of surface and the overall look and feel of the aesthetic design. One of the judges commented on KSRs window that a significant element of design has gone into this window, the effect is impressive. We can’t wait for the Surface Design Show ceremony and the winners’ announcement on the 7 February! Read more about the project here and here.